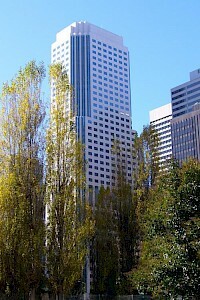 1999 Broadway is a 544ft (166m) tall skyscraper in Denver, Colorado. It was completed in 1985 and has 43 floors. The building was designed by Curtis W. Fentress, FAIA, RIBA of Fentress Architects and is the 5th tallest in Denver. 1999 Broadway has a unique shape, it is shaped like a triangle with a scoop in the side. This is caused by the desire to retain the historical Holy Ghost Catholic Church at the base. 50 Fremont Center is a office skyscraper rising 600 ft. (183 m) up from Fremont and Mission Street on the boundary of the San Francisco's Financial District and South of Market Area (SOMA). The tower has 43 stories and was completed in 1985. 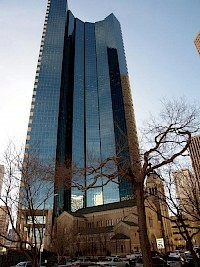 50 Fremont street was developed and owned by Fremont Properties who sold the building in 2000, which was later purchased by Hines, who in turn sold the property to TIAA-CREF in early 2005. 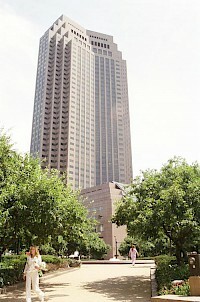 200 Public Square (also known as the Sohio Building, Standard Oil building, the BP America Building, BP America Tower, BP Tower, or the BP Building) is the third tallest skyscraper in Cleveland, Ohio. The building, located on Public Square in Downtown Cleveland reaches 45 stories and 658 ft (201 m) and holds 1.2 million square feet (111,000 m²) of office space. Beginning in 2011, the building will be the Cleveland headquarters for Huntington Bancshares. 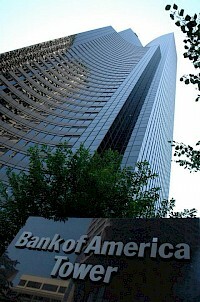 Citigroup Center is a 42 story, 588-foot (180 m) skyscraper in Chicago, Illinois. Located at 500 W. Madison (between Clinton and Canal Streets), the structure was designed by the architecture firm Murphy/Jahn in a late modernist style. 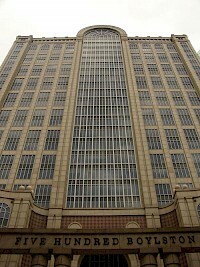 The building, previously named the Northwestern Atrium Center, was constructed between 1984 and 1987 on the air rights obtained by the destruction of the headhouse of the 1911 North Western Station. 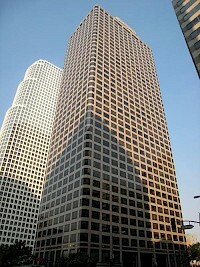 The Ernst & Young Plaza is a 534-foot (163 m) tall skyscraper in Los Angeles, California. It was completed in 1985, has 41 floors and is the 17th tallest building in Los Angeles. 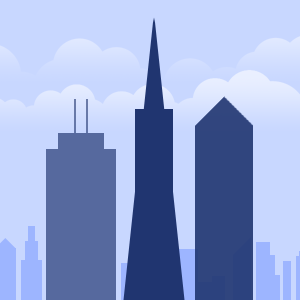 The tower is currently owned by Brookfield Properties Inc, and was designed by Skidmore, Owings & Merrill LLP. 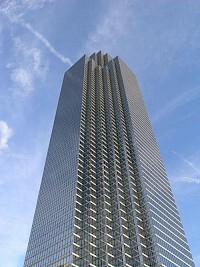 Even though it is in California, this building was placed in the New York skyline in the movie The Day After Tomorrow. Exchange Place is a modern skyscraper in the Financial District of Boston, Massachusetts. Built in 1985, it is tied with the neighboring 60 State Street as Boston's 12th tallest building, standing 510 feet (155 m) tall, and housing 40 floors. The modern glass skyscraper rises out of a previous building, the 12-story Boston Stock Exchange, built in 1896. 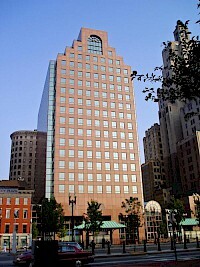 Exchange Place is home to the Boston Consulting Group, law firm Goodwin Procter, and The Blackstone Group.